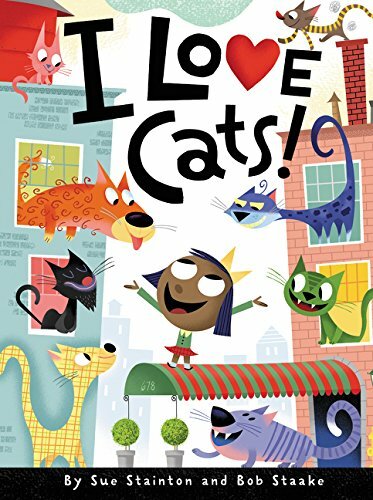 a book review by Marissa Moss: I Love Cats! In fact, this book turns out not to be about wanting a pet at all, though that is how it ends, in an abrupt scene of previously invisible parents bringing home an adopt-a-pet kitten. This is not meant to be a story at all, but a concept book, a series of fun, bright pages about cats. There is some word-play so the “fat cat” is shown coming out of a bank with a big bag of money, but mostly the cats just act out however they are described. The “cool” cat, for example, licks an ice cream cone. The lack of character development in the girl and plot in the pages may be disappointing to those who want more of a story in their picture books. The art is bright and appealing but provides no narrative beyond the slapped-on ending. There is no sense of a journey through the pages, just one cat episode after another. In fact the pages could be shuffled and re-arranged with no change in how the book reads. You might need to be a cat person to be entertained by a series of cats performing through the pages. Other readers might want a more substantial story, one with a beginning, middle, and satisfying ending.